MIT Press has recently published a new book by MUSTS researcher Joeri Bruyninckx. The book deals with the transformation of sound recording into a scientific technique in the study of birdsong, as biologists turned wildlife sounds into scientific objects. Scientific observation and representation tend to be seen as exclusively visual affairs. But scientists have often drawn on sensory experiences other than the visual. Since the end of the nineteenth century, biologists have used a variety of techniques to register wildlife sounds. 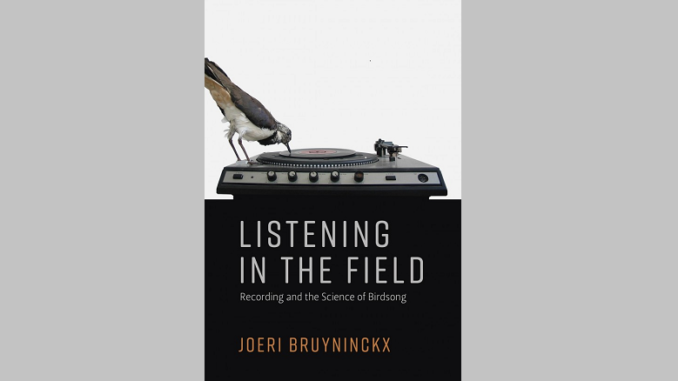 In this book, Joeri Bruyninckx describes the evolution of sound recording into a scientific technique for studying the songs and calls of wild birds and asks, what it means to listen to animal voices as a scientist. The practice of recording birdsong took shape at the intersection of popular entertainment and field ornithology, turning recordings into objects of investigation and popular fascination. Shaped by the technologies and interests of amateur naturalism and music teaching, radio broadcasting and gramophone production, hobby electronics and communication engineering, birdsong recordings traveled back and forth between scientific and popular domains, to appear on gramophone recordings, radio broadcasts, and movie soundtracks. Bruyninckx follows four technologies—the musical score, the electric microphone, the portable magnetic tape recorder, and the sound spectrograph—through a cultural history of field recording and scientific listening. He chronicles a period when verbal descriptions, musical notations, and onomatopoeic syllables represented birdsong and shaped a community of listeners; later electric recordings struggled with notions of fidelity, realism, objectivity, and authenticity; scientists, early citizen scientists, and the recording industry negotiated recording exchange; and trained listeners complemented the visual authority of spectrographic laboratory analyses. This book reveals a scientific process fraught with conversions, between field and laboratory, sound and image, science and its various audiences. For more information, see the website of MIT Press.